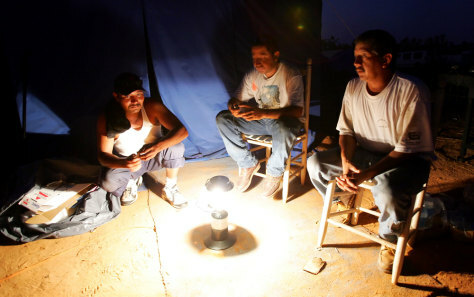 From left, immigrant workers Gabriel Juandiego, Manuel Tierrablanca and Jose Torres talk over a lantern at a makeshift camp in Ocean Springs, Miss. for workers involved in Hurricane Katrina recovery in this Oct. 21 file photo. Tens of thousands of Latinos have moved into the region.